Laurence Kayaleh, notre compatriote violoniste, se trouve actuellement au coeur d’une saison musicale riche en activités. En effet, elle a débuté sa saison l’année dernière avec un séjour à Tokyo lors duquel elle s’est produite en récital à la magnifique JT Hall. Elle a également dirigé des classes de maître lors de ce séjour. Par la suite, elle s’est produite dans le cadre de nombreuses séries de concerts au Canada, incluant la fameuse série « The Coast Recital Society » en Colombie-Britannique, et dans le cadre d’un enregistrement elle s’est rendue aux studios de la Radio CBC à Vancouver. Laurence Kayaleh poursuivra sur sa lancée et se produira en récital le 7 février 2019 à la Chapelle Historique du Bon-Pasteur à Montréal, ainsi que le 10 février à l’Église Plymouth-Trinity dans le cadre de la Maison d’Opéra et de Concerts de Sherbrooke.Le public basé au Québec pourra ainsi profiter de ce programme passionnant mettant en vedette le violon et la guitare. À noter qu’elle aura préalablement présenté ses concerts à Sain Miguel de Allende au Mexique les 18 et 20 janvier 2019. Sa tournée se poursuivra en Suisse, le 16 février 2019 au Fairmont Montreux Palace Hôtel, puis elle ira en Ontario pour se produire le 27 février 2019 au Kitchener – Waterloo Chamber Music Society, le 2 mars au Great Hall à Caledon et le 3 mars au Heliconian Hall Toronto. De plus, elle jouera le 17 mars 2019 à la Maison de la Culture de Verdun au Québec, lors d’un concert consacré à la superbe musique de Johannes Brahms. Pour finir, au cours de l’année 2019, elle sortira deux nouveaux albums chez NAXOS Records consacrés à l’intégrale des sonates pour violon et piano du compositeur germano-suisse, Joachim Raff ! Toutes ces dates seront l’occasion de voir sur scène Laurence Kayaleh et d’entendre sa virtuosité ! Laurence Kayaleh’s performance conveys a vast and noble essence, much like a tree stretching and spreading its roots deep into the Earth. She carries herself with the presence and dignity of the great Masters. Her sound; profound, deep and heavy, comes from a Pietro Guarnerius which once belonged to the Great Master and Pedagogue Carl Flesch. Brought up in a family of musicians, Laurence Kayaleh has been greatly influenced by the Masters, such as Milstein, Menuhin and Szeryng, who have provided her with experiences and advice throughout her life. Her performance of the Szymanowsky Sonata accurately and thoroughly expresses the delicate sentiments and powerful passion of the late-romanticism. Fauré’s Second Sonata has held the tension and the atmosphere in the hall, without becoming overly sentimental. It reminds the audience that this work was written during the First World War. The impeccable performance of Franck’s Violin Sonata is, without a doubt, worthy of such a monumental work. The feeling of respect that Mrs. Kayaleh holds for the composer is palpable; this, however, does not hinder her spontaneity, and the music remains lively and vivid. Mr. Yusuke Kikuchi has communicated openly and freely with Mrs. Kayaleh, and the ensemble appeared to be in constant harmony. Their manner of praising each other after the performance expresses a heartful and honest interaction between the two artists. Large-scale music, then, and Laurence Kayaleh and Stéphane Lemelin give it large-scale performances […] they’re both powerful players and the music often suits a red-blooded approach (listen to Kayaleh from 6’19 » in the Second Sonata to hear her low register in all its gutsy glory). They’re at their best in Catoire’s grand, cascading climaxes. Georgy Catoire était un compositeur russe que Tchaïkovsky avait en haute estime. Cela n’a pas suffi, car il est presque totalement oublié de nos jours. Pourtant, sa musique est si belle! Exceptionnelle, même. C’est ce qui rend l’album que lui consacre Naxos tellement indispensable. La violoniste suisse (qui enseigne également à l’Université de Montréal) Laurence Kayaleh, et le Québécois Stéphane Lemelin, au piano, jouent tout le répertoire pour violon et piano de ce compositeur né en 1861. Et c’est une réussite! 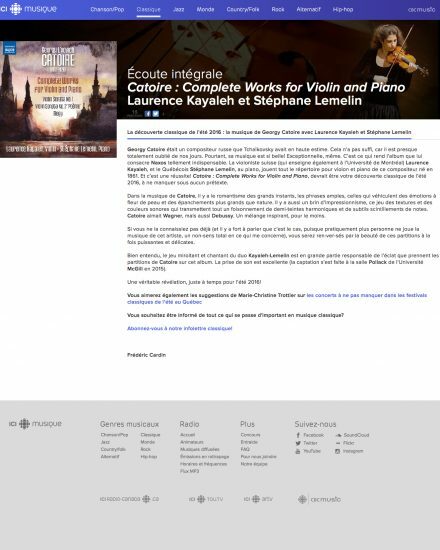 Catoire : Complete Works for Violin and Piano, devrait être votre découverte classique de l’été 2016, à ne manquer sous aucun prétexte. Dans la musique de Catoire, il y a le romantisme des grands instants, les phrases amples, celles qui véhiculent des émotions à fleur de peau et des épanchements plus grands que nature. Il y a aussi un brin d’impressionnisme, ce jeu des textures et des couleurs sonores qui transmettent tout un foisonnement de demi-teintes harmoniques et de subtils scintillements de notes. Catoire aimait Wagner, mais aussi Debussy. Un mélange inspirant, pour le moins. Si vous ne la connaissiez pas déjà (et il y a fort à parier que c’est le cas, puisque pratiquement plus personne ne joue la musique de cet artiste, un non-sens total en ce qui me concerne), vous serez ren-ver-sés par la beauté de ces partitions à la fois puissantes et délicates. Bien entendu, le jeu miroitant et chantant du duo Kayaleh-Lemelin est en grande partie responsable de l’éclat que prennent les partitions de Catoire sur cet album. La prise de son est excellente (la captation s’est faite à la salle Pollack de l’Université McGill en 2015). Une véritable révélation, juste à temps pour l’été 2016! The surname sounds French, but Georgy L’vovich Catoire (1861–1926) was Russian through and through, at least until he tasted the forbidden fruit of Wagner, courtesy of his studies in Berlin with Karl Klindworth. Catoire’s Wagnerian inclinations did not endear him to his Russian contemporaries back home, so upon his return to the motherland, Catoire sought to “Russianize” himself by entering the conservatory in St. Petersburg. There he hoped to study with Rimsky-Korsakov, but after one lesson, the composer of Scheherazade turned Catoire over to Anatoly Lyadov. Catoire had talent, or so everyone said, but no one seemed able or willing to put up with him for any length of time. Reputedly, the young man was a difficult student, acrimonious and with an argumentative, combative nature. So even though he went through a number of different teachers, to a large extent Catoire ended up being self-taught. But then he met Tchaikovsky and Arensky, both of whom were very supportive of Catoire and exerted a strong influence on his music going forward. Considering his lifespan of 65 years, however, Catoire’s total output is quite small – only 36 opus numbers, a majority of which date to after 1900. Ironically, perhaps, the bad student turned out to be a respected and well-regarded teacher. In 1917, he was appointed professor of music theory and composition at the Moscow Conservatory, a position he held until his death; and at least one of his students, Dmitry Kabalevsky, would go on to achieve a measure of fame. 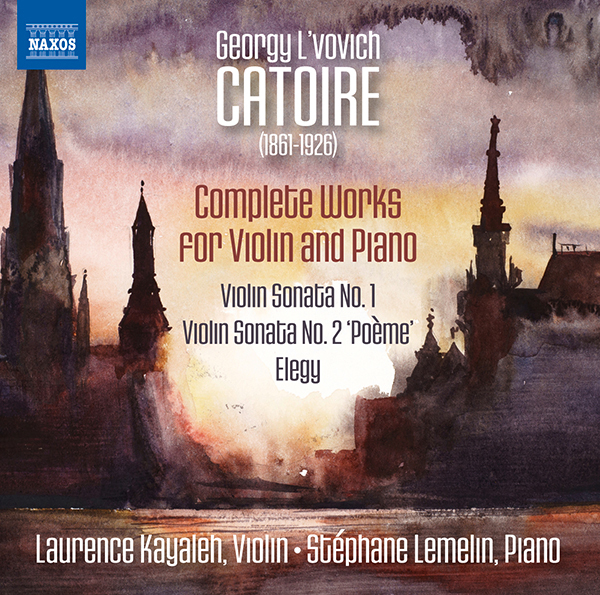 Contained on this disc are Catoire’s complete works for violin and piano—two sonatas and an elegy. Other major works include a symphony, a symphonic tone poem, a piano concerto, a handful of chamber works, and a cantata, Rusalka, for solo voice, women’s chorus, and orchestra. Other than that, the remainder of Catoire’s output consists mainly of songs and salon-type pieces for solo piano. As you might expect, recordings of Catoire’s works are not all that many, but when you consider how few works he actually wrote, a good percentage of them are indeed represented on disc, including his symphony, a version of which was reviewed by Barry Brenesal in 36:6. The violin works on the present CD have been previously recorded as well, most recently by Laurent Albrecht Breuninger and Anna Zassimova on CPO (see review in 33:6). Two years earlier, Herwig and Bernd Zack undertook the same program for Avie, and for good measure, added a couple of pieces by Ravel to fill out their disc (see 31:6). But possibly the first to record Catoire’s violin works was David Oistrakh with pianists Vladimir Yampolsky and Alexander Goldenweiser back in 1948 and 1952 (see Robert Maxham’s review in 22:4). 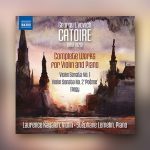 With these latest versions by Laurence Kayaleh and Stéphane Lemelin, Catoire can’t complain that his three works for violin and piano aren’t played. I’ve had the Brueninger/Zassimova CPO CD in my collection since it was released in 2010, and comparing it to this new effort by Laurence Kayaleh and Stéphane Lemelin is instructive, not to mention revelatory. For starters, CPO’s album cover is simply titled Georgy Catoire – Works for Violin and Piano, whereas Naxos’s album cover is titled Georgy Catoire – Complete Works for Violin and Piano; yet the CPO disc contains an additional piece, the Romanze for viola and piano, op. 1/4, in a transcription for violin. One can always split hairs, of course, but Kayaleh, Lemelin, and Naxos have got it right because the Romanze is not technically a piece for violin and piano. My first thought was that the 2:49 difference in the first movement of the Sonata No. 1 was due to a skipped repeat by Kayaleh and Lemelin, which would have been a strike against them had that been the case. But as luck would have it, the score is online and there is no repeat. It is, however, a long and complex movement with dozens of meter and tempo changes, so I can see how two performances could vary to such an extent. But not only are Breuninger and Zassimova slower in every single movement, the degree to which they are slower is quite eyebrow-raising. The effect is immediately obvious. Catoire designates the first movement of his B-Minor Sonata Allegro non tanto, ma appassionato, with a metronome marking of 132 – 152 to the quarter-note. In other words, he gives the players considerable leeway in the tempo. Breuninger and Zassimova opt for the lower end of that range, while Kayaleh and Lemelin opt for the higher end, launching into the movement with a fiery passion that will sweep you away. This is music of wide-ranging Romantic gestures and heated musical rhetoric, and on the page, it looks frightfully difficult. Rhythmically, alone, it would have made Brahms blanch. The meter shifts repeatedly from 3/4 to 5/4 and from 3/2 to 2/2, with bars which arithmetically don’t quite add up, but in the playing manage to come out in the wash. Harmonically, the music is no less complicated. I can’t recall any music from this period, other than pieces by Debussy that have as many accidentals – not just your garden variety sharps, flats, and naturals, but vast numbers of double sharps in practically every measure. Katy Hamilton, in her liner note, touches on this when she says of Catoire, “In later years, he also became interested in the music of the French Impressionists, and several of the pieces on this disc seem to bear traces of Debussyan harmonies and colors.” Catoire was 43 when he completed his B-Minor Violin Sonata in 1904, which would make it chronologically proximate to works by Debussy such as Estampes, L’isle joyeuse, and La mer. Is it possible that Catoire heard any of these works? The evidence of this sonata suggests he had. The second movement, a Barcarolle, lives up to its genre, with a gently rocking piano part and a singing violin line tinged sad and tinted slightly modal. The finale combines scherzo-like elements with driving toccata-like rhythms and soaring lyrical passages that propel the sonata to an exciting conclusion. The D-Major Sonata, subtitled “Poème,” dates from 1906, and is in a single, extended movement. I keep reading about the deep-rooted Russian character of Catoire’s music, but my ears just don’t hear it. The more I listen to these works, the more French they sound to me. Not to cite the obvious, but there really are passages in Catoire’s “Poème” Sonata that echo Chausson’s famous Poème of 1896. I also hear, though more distantly, echoes of César Franck and later of Fauré and Guillaume Lekeu. What I don’t hear is anything that reminds me of Tchaikovsky or Arensky, presumably the major influences on Catoire. Whoever or whatever inspired this work, the music is of alluring, even spellbinding beauty. The brief Elegy was composed somewhere around 1915, give or take a couple of years. On first hearing, it sounds like melancholia in the style of a salon piece. Rhythmically and harmonically, however, it’s as sophisticated, if perhaps more subtle, than the composer’s more ambitious sonatas. I cannot imagine two artists more sympathetic to this music or better equipped technically to rise to the challenge of conquering its many difficulties than Laurence Kayaleh and Stéphane Lemelin. Kayaleh’s tone never turns brittle or abrasive, even in the most fraught passages, and her intonation and finger-to-bow coordination are models of perfection. In addition, she displays a special feeling for Catoire’s unique expressive voice. It’s worth mentioning that Kayaleh has also recorded the complete works for violin and piano by Nikolai Medtner, the younger Russian composer to whom Catoire dedicated his First Violin Sonata. In works for violin and piano, of course, it takes two to tango, and Kayaleh’s dance partner here, Stéphane Lemelin, offers up Catoire’s highly complex, nuanced, and endlessly demanding keyboard choreography with absolute assurance and telling communicative power. These performances and this release should go a long way towards inspiring interest in a Russian composer whose unique voice was largely drowned out by Tchaikovsky before him and Rachmaninoff after him. Urgently recommended. 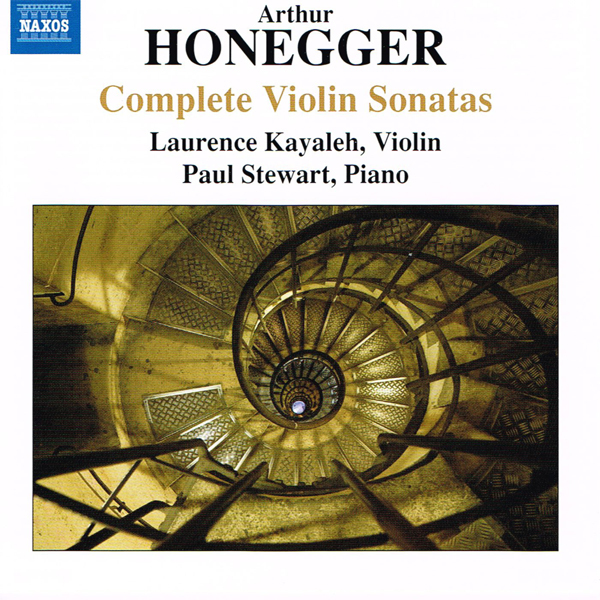 Laurence Kayaleh and Paul Stewart follow up their fine two-disc Medtner survey for Naxos with the only single disc of Honegger’s four violin sonatas currently available. 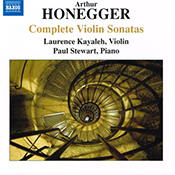 It makes for fascinating listening as the three accompanied sonatas date from between 1912 and 1919, a time when Honegger was still finding his creative feet working with sonata procedures, whereas the Solo Sonata of 1940 revisits the Bach tradition from the perspective of an out-and-out neo-Classicist. Kayaleh’s warm, gentle sound is especially well suited to the espressivo richness of the early D minor Sonata (‘no.0’), an astonishingly assured work dating from Honegger’s first year at the Paris Conservatoire. Kayaleh traces the music’s radiant contours with a heightened sensitivity to phrasing and an occasional portamento inflection, whose precision timing brings to mind the young Heifetz. The two numbered sonatas are exploratory works that require enormous skill and patience, and here Kayaleh and Stewart achieve a near‑perfect balance between youthful exuberance and a beguiling sense of inner calm, complemented by exceptionally well-balanced sound. In the tricky four-movement Solo Sonata, Kayaleh produces a seductively cushioned sound on her glorious 1742 Guarneri, although here I wondered whether she might have thrown herself into the fray with an even greater sense of abandon. […] Un bell’esempio del lavoro del Società del Quartetto lo ha offerto il bel concerto del duo composto dalla pianista olandese Ingrid Hoogendorp e dalla violinista Laurence Kayaleh. Tecnicamente, la violinista ha un controllo e un dominio timbrico di prim’ordine : dal suo Guarneri sono usciti colori magnifici, densi di poesia e di vibrati suadenti, distribuiti con grande accuratezza. L’interpretazione della celebre Ciaccona BWV 1004 di Bach ne individuava una vena contemplativa non meno spiccata : niente velocità mozzafiato, corse a precipizio e passaggi acrobatici : tutto il lungo lavoro di variazione creato dal Kantor di Lipsia sotto le sue dita era restituito con centellinata misura, senza sprecare una sola nota. Una meditazione, quasi al limite della prudenza se non fosse invece evidente la volontà di farne un disegno limpido e minuzioso. Altra sostanza, romantica, animava invece le Sonate di Grieg e di Brahms (la magnifica terza op. 108) in cui slancio e intensità duettavano con simbiosi sagace con la pianista. Sì anche qui lo slancio non era impetuoso e travolgente: ma era acceso e contagioso, la sapienza interpretativa non toglieva nulla alla generosa retorica dei due autori, trattati con intelligenza musicale sempre pronta e vigile. Paradossalmente l’eleganza misurata ed equilibrata di Leclair, proposta in apertura di serata, fungeva da potenziale sintesi della proposta nel suo complesso : tra eleganza e ragione, tra emozione e misura. 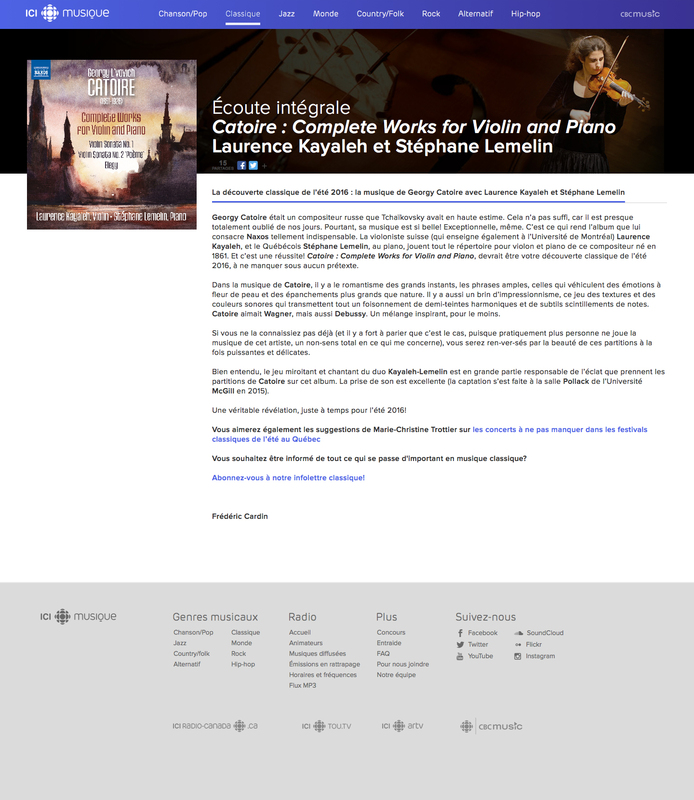 […] Laurence Kayaleh is a real virtuoso violinist. She doesn’t trip over any of Medtner’s runs or fast, bounced bowings; and she sounds a lot like Heifetz in the « Fairy Tale ». […] Ms. Kayaleh and Mr. Stewart tackle this piece with ferocity and oozing musicality. They are a joy to listen to. The duo of Kayleh/Stewart is a real powerhouse that sells this music. The music of Medtner could come off as « just another Russian-style Romantic » but these two really plumb the musical and emotional depths within. If you need a boost of passion in your listening, look no further than this disc. […] Laurence Kayaleh and Paul Stewart play Medtner’s music with affection and commitment. Kayaleh is a violinist of character. Her tone is sweet rather than rounded, and she knows how to shape and colour a phrase. Her tuning is impeccable and she handles the finger twisting runs, fiendish double stopping and leaps across the violin’s range with easy virtuosity. Canadian pianist Paul Stewart plays his part with sensitivity and lightness of touch. While his fingers easily handle Medtner’s virtuosic piano writing, he is not at all showy, preferring to caress Medtner’s melodic lines and romantic harmonies. His interplay with Kayaleh is delightful. He also contributes the excellent liner notes which skilfully entwine biographical details with comments on the music. Medtner has often been dismissed as a stuffy Russian Brahms born half a century too late, or as Rachmaninov without the tunes. Both assessments are unfair, and this disc will show you why with greater eloquence than I can muster. It will also kindle within you an affection for this neglected composer and a desire to know him better. Bring on volume 2 ! […] L’expressivité puissante, parfaitement assumée par l’archet de Laurence Kayaleh (cf. Allegro eroico final), est tenue tout au long du disque. Les jeunes artistes canadiens font bien plus qu’ »aligner des notes ». À titre d’exemple, on écoutera le singulier effet de cymbalum obtenu par Paul Stewart vers 9’30 du Finale. Franchement, je ne suis pas un admirateur habituel de Medtner, mais cette partition m’a vraiment impressionné, et les artistes y sont pour quelque chose, car ce n’est pas une mince affaire que de soutenir une telle architecture. Ce tour de force, enregistré d’un peu trop près, est admirablement complété par trois nocturnes et un arrangement de Jascha Heifetz. Bravo ! […] Violinist Laurence Kayaleh and pianist Paul Stewart capture the fresh-faced charm of the Sonata as well as its virile energy and deep moments of sombre thoughtfulness. The easeful melodic invention of the earlier Three Nocturnes (written in Russia, but inspired by Goethe’s poem Nachtgesang) is equally seductive and expansive. Jasha Heifetz’s transcription of the Fairy Tale Op20 No1, originally written for solo piano, packs an unexpectedly powerful emotional punch into its brief appearance. Plenty pleasant surprises all round, and more to come in Volume 2. […] The Sonata (N. Medtner – Sonata No. 3 « Epica ») is demanding on both stamina and technical ability, the Kayaleh/Stewart duo well endowed with both. It requires a firm hand to shape and unify the structure which they do admirably, bringing a jazzy mood to the Scherzo, while never allowing the music too sink in self-pity. The remaining tracks are equally well played. Admirable sound quality. Par la totalité de leur engagement et la force de leur sonorité, la violoniste Laurence Kayaleh (remplaçant Olivier Thouin à la dernière minute) et […] projetaient dans le néant les minables cordistes du Gryphon […]. Avant tout, ce «trio d’un soir» conféra à la pièce de l’élève Chostakovitch la dimension d’une grande oeuvre. Quels musiciens! Une autre rareté suivait : les Sept Romances d’Alexander Blok […]. Toute la participation instrumentale est à signaler, en particulier les électrisantes séquences en triples croches de Kayaleh dans la troisième pièce […]. […] an unusually strong violinist, with a huge, dark, throbbing tone, an acute ear, an unremitting intensity of manner and expression. There is no denying that Kayaleh is a major talent. Miss Kayaleh possesses the power of genius which, unhindered, overcomes the difficulties of music forms as well as dangerous reefs of vain empty intellectualism […] music is in every instrumental intonation of hers, in every phrase, continued in the unimitable beauty of her violin’s sounds. […] un talent hors du commun […] un archet royal, une justesse impeccable, une sonorité superbe, et surtout un sens inné du phrasé […] un talent lumineux dont nous pouvons tout attendre. She extracts a huge, beautifully developed tone from the 1742 Guarnerius she plays […] impressive exacting control of the sound throughout the registers […] impeccable intonation. Kayaleh is capable of great expressivity without resorting to any stage antics. Kayaleh’s youthful exuberance shined through her performance. She seemed much like another young prodigy in another field, tennis titan Steffi Graf. Like Graf, she approaches her art with love, respect and enthusiasm. Switzerland can be proud for producing a musical export like Miss Kayaleh. Kayaleh flew in with a brilliant, decisive entrance, her Guarneri violin resonating over the well-rehearsed orchestra. Slatkin proceeded to match Kayaleh’s virtuosity measure for measure. Little was left to criticize on Kayaleh’s triumphant conclusion. […] full-bodied tone, lovely sound and rock solid technique. Kayaleh plays with intensity, and one never doubts her engagement with the music. Souverän, kraftvoll, überzeugend […] Beeindruckend ! Hier drängte sich wirklich eine Parallele zum jungen Mozart auf. Erstaunliche technische Sicherheit […] die Musik war durch und durch empfunden […] Sensibilität sprach aber aus dem schönen Ton. Beeindruckend ! substanzreichen Ton, der ihrer im besten Sinne expressiven Interpretation die Grundlage bot. […] une exécution parfaite et fougueuse […] une aisance et un naturel qui laissent l’auditeur ébloui par tant de dons. Il faut se rappeler du nom de Laurence Kayaleh! Avec Laurence Kayaleh, c’est la révélation d’une authentique et profonde personnalité étonnemment mature. L’expression, le contenu, la qualité d’une âme qui naît et bouleverse l’adulte […] royal violon, royalement manié. Superbe. Elle a tout pour elle : le talent, la musicalité, la virtuosité, la maturité et la beauté. Ses coups d’archet, ses attaques ne ressemblent qu’à ceux des plus grands […] une personnalité si accomplie, une puissance si naturelle. C’est l’apparition d’une nouvelle étoile du violon. Une grande dame du violon, qui sait pourtant garder toute la simplicité et la modestie des vrais artistes. Sonorité d’une superbe étendue, virtuosité sans faille, sens stylistique. […] une personnalité authentique, un jeu d’une élégance rare, une distinction naturelle rarement rencontrée. Une étoile se lève au firmament des violonistes.